I had a wonderful day with my mom in Manhattan yesterday. 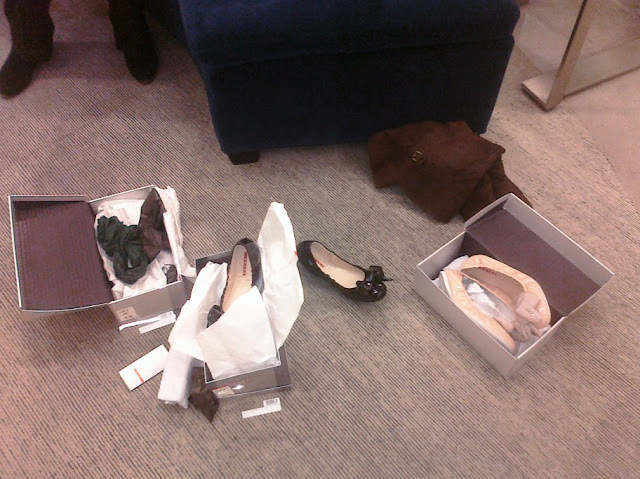 We went to several stores, but we spent most of our time at Saks. Louis Vuitton finally had the agenda refills I needed, and I'm very pleased with them! I also got the most amazing Zac Posen blouse, a lovely Kate Spade cardigan, and two pairs of Prada shoes. Let's start off with the Louis Vuitton agenda refills. I have to say, I am immensely glad that I purchased my agenda. It is so durable, and it still looks brand new. It makes me smile every time I use it, and it's so useful! I love to write stuff down and I have used agendas/planners for most of my life, so I think I made a wise investment in something that I will use for years to come. I had previously owned (well, I still own it) a Kate Spade agenda, but the quality of the two is honestly just incomparable. The KS agenda had problems with the rings and it got super dirty very easily. I was pleasantly surprised that I got a new bookmark, a new ruler, and new stickers. I was previously kind of apprehensive about using up my stickers (lol) but now that I know I will get new ones with every refill, I will use them a whole lot more! :) I also will be less meticulous and crazy about getting the ruler dirty with pencil marks. Rulers are meant to be used! The older bookmark was actually two bookmarks - a bag and a trunk. This year, it's a hot air balloon. The old agenda papers had a very handbag/luggage feel to them, with drawings of handbags and trunks in between some of the pages, while the new ones have more travel-oriented photos, and lots of hot air balloons! Let's start off with the item I saved on! I got Prada Sport sandals....for $25. I discovered a new thrift store in Brooklyn that has sparked my interest, and I will definitely be going back there, though they have a mixture of good and not so great stuff. In case anyone is interested in buying these, here is the information. They run small in my opinion - I can be anywhere from a 38.5 to a 39, and I got these in a 39.5. I could fit into the 39s but they were not nearly as comfortable. They were $390, and about $420 after taxes. I love them - they look absolutely darling! Okay, now moving on to clothes. Both of these were purchased from Buffalo Exchange. 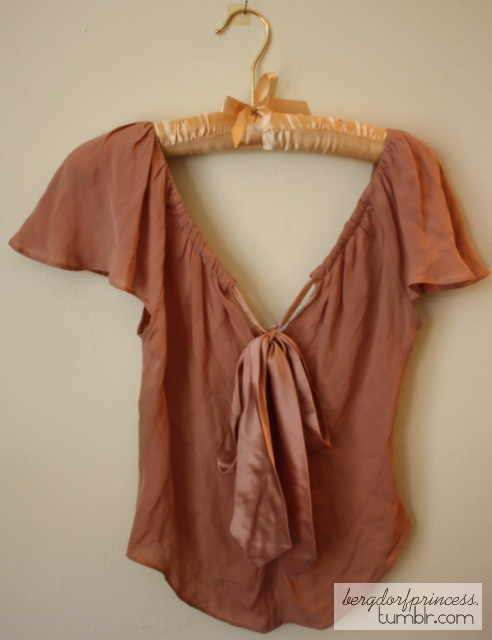 This is the Zac Posen blouse. It didn't photograph too well because I didn't have great lighting - it's a bit lighter than in these photos and it looks so beautiful and delicate. My mom actually spotted it, and she brought it to me and was like "You have to get this." I immediately loved it, because, hello, this is right up my alley....and then I saw it was by Zac Posen. Amazing! 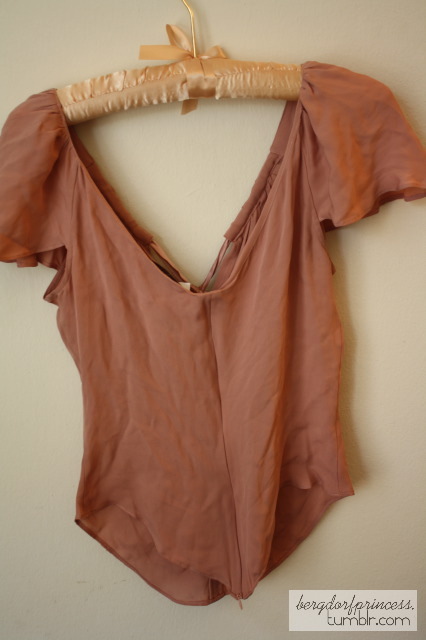 This was only $28 - Zac Posen blouses can run anywhere from $300 - $700, and probably even more. 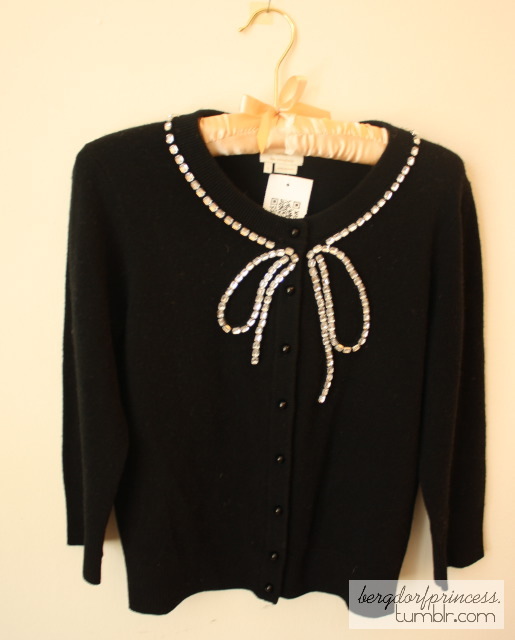 This is my second Kate Spade cardigan so far. They are very warm and cute! It is embellished with crystals that form a lovely bow at the front and go around the collar. I know I told myself not to get any more cardigans, but this one was too cute to pass up! I'm such a cardigan fanatic. I have Chanel Vamp on my nails right now and I absolutely love this shade! It's perfect for fall/winter. How much was the Kate Spade cardigan when you bought it? 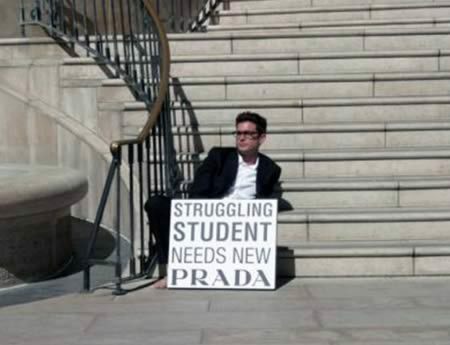 the prada flats are so cute. i was actually looking into those, and i see that you say they're comfortable. 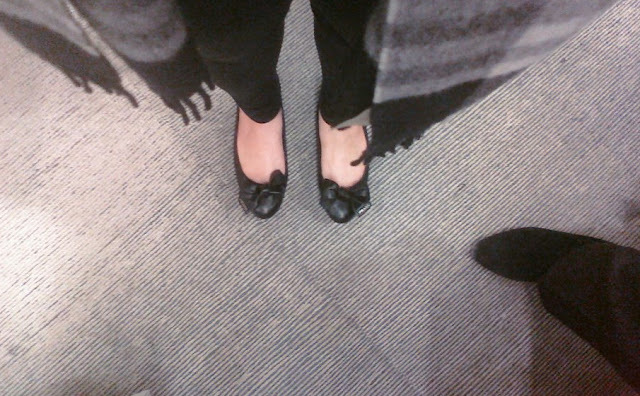 i have a pair of CL sonietta black nappa flats that aren't so comfortable that i am looking to replace. thanks for sharing! Is that the medium refill that's online for $100? I really wanted to invest in a Louis Vuitton organizer, but $100 is a bit steep to pay every year! Yikes. I have a Coach agenda now that I found on sale about 4 years ago and it's held up surprisingly well. (I sort of planned on it being all junky by now LOL!) So now I find it hard to justify spending so much when I still have a nice one with refills for under $30. Gabrielle - those refills are fabulous! Anon - I go to both. It doesn't really matter which one you go to, it's all really a matter of luck! Prada flats are so adorable! 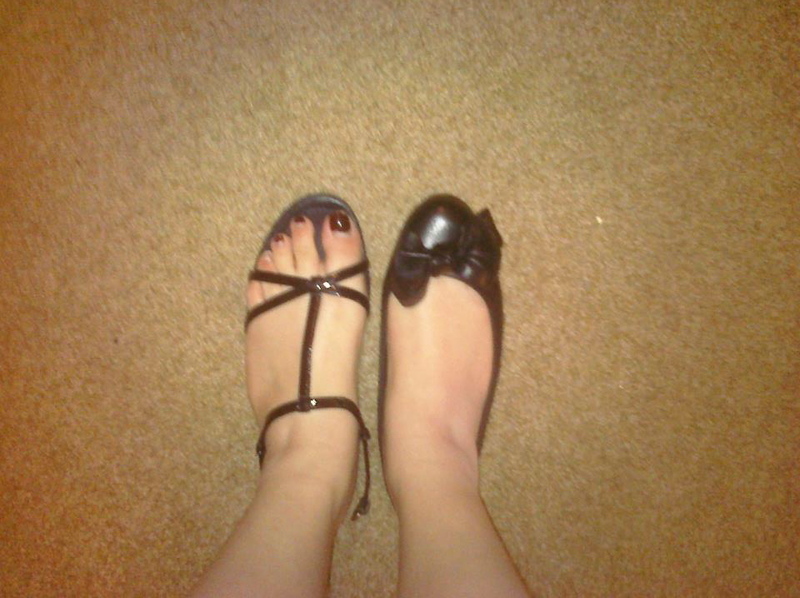 I have the rose/beige nylon bow flats and they get dirty quickly so I rarely wear them. The refills for 2012 are adorable. I haven't been using my agenda so I haven't bought any refills but the stickers are so cute. Love the purchases! First I wanted to say that I love your blog and tumblr. Then I wanted to ask how you know all these store with big brands for cheap prices?! I'm so jealous of these prada flats and the tiffany&co bracelet that you bought for so much cheaper!! OMG I love everything but notebook is awesome! OMG Yana! I'm so jelaous of you girl! and i love all your purchases!!!!! 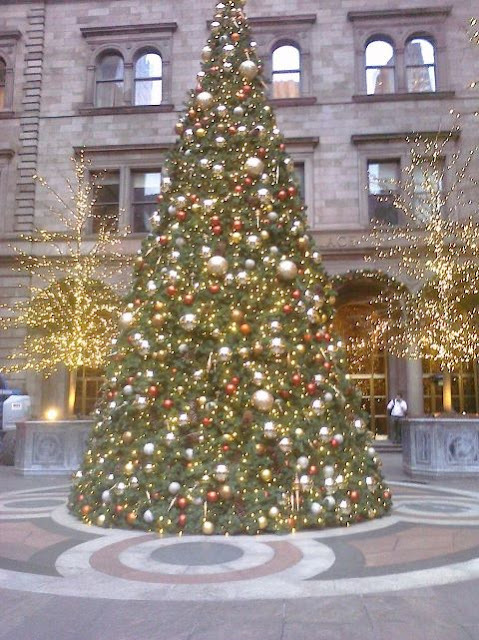 have a wonderful 2012!!!!!! Wooow you defenitily make such a good bargain!.. i dream to go to ny so bad!.. great to find your blog! so much interesting info here.. I already follow your tumblr and instagram! Hi! I'm Yana. I'm a 22-year-old living in New York, blogging about fashion, food, and life in this beautiful city! Thrifting: Chanel, Salvatore Ferragamo, Prada, Lanvin, Tory Burch, Burberry, Coach, Tibi, and more! Google’s use of the DART cookie enables it and its partners to serve ads to this site’s users based on their visit to your sites and/or other sites on the Internet. Please do not redistribute my photos without permission. Powered by Blogger.